LAS VEGAS – Fulfilling the wish of every child who has ever played with one, Chevrolet and Hot Wheels® have created a life-size Hot Wheels Camaro Concept. The car debuted at the 2011 SEMA Show – the aftermarket industry’s premier display of automotive toys. The Camaro Hot Wheels concept is inspired by the “Custom Camaro” – the dazzling Spectraflame® 1:64-scale toy that was part of the original 16 Hot Wheels cars released in 1968. The project was a collaborative effort between the General Motors Design studio in Michigan and the Hot Wheels Design studio in California. 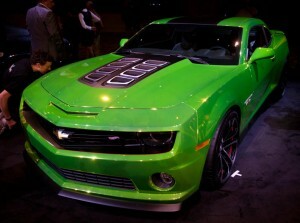 Each sketched its own ideas of a life-size Hot Wheels Camaro, compared notes and refined their visions until the concept hit the right note for each group of designers.